What are the misspellings for suppose? 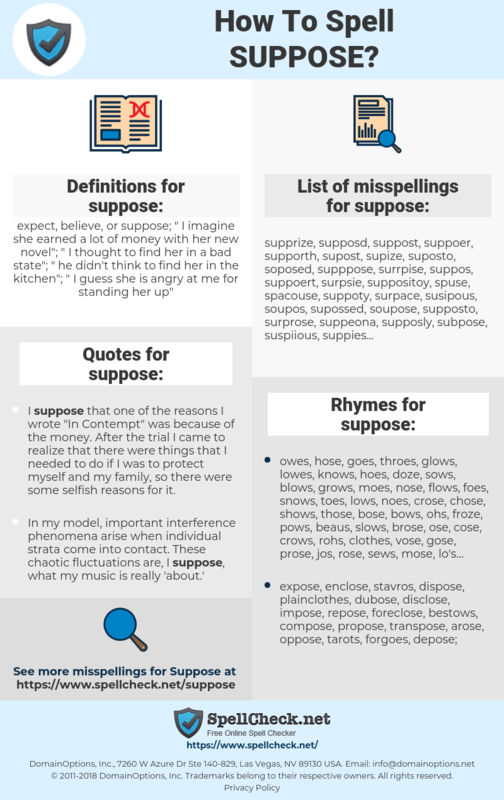 What are the common mistypes for suppose? What is the definition of suppose? What are the quotes for suppose? What are the rhymes for suppose? What are the translations for suppose? 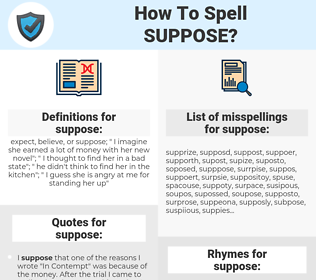 What are the common typos for suppose? expect, believe, or suppose; "I imagine she earned a lot of money with her new novel"; "I thought to find her in a bad state"; "he didn't think to find her in the kitchen"; "I guess she is angry at me for standing her up"
This graph shows how "suppose" have occurred between 1800 and 2008 in a corpus of English books. And yet, I suppose you mourn the loss or the death of what you thought your life was, even if you find your life is better after. You mourn the future that you thought you'd planned. stellen, annehmen, vermuten, voraussetzen, unterstellen, mutmaßen, denken, imaginär. considerar, asumir, suponer, estimar, figurarse, presumir, pensar, sospechar, conjeturar, presuponer, anta.